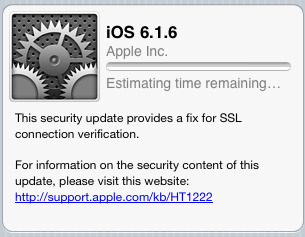 iOS 7.0.6 Firmware (Build: 11B651) and iOS 6.1.6 Firmware (Build: 10b500) for iPhone, iPad and iPod Touch devices has been officially released by Apple with an official changelog includes "A fix for SSL connection verification" which is an important security update for iPhone 5S, iPhone 5C, iPhone 5, iPhone 4S, iPhone 4, iPhone 3GS, iPod 5G Touch, iPod 4G Touch, iPad Air 5G, iPad 4G, iPad Mini, iPad Mini 2, iPad 3G and iPad 2G devices. 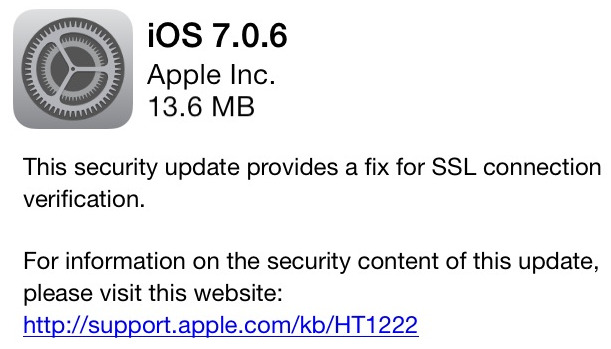 The Official Direct Download Links of iOS 7.0.6 IPSW Firmwares and iOS 6.1.6 IPSW Firmwares is available. Before the final release of iOS 7.1 Official Firmware, we can expect more similar updates from Apple in the form of iOS 7.0.7 or iOS 7.0.8 in near future. Apple iOS 6.1.6 (Build: 10b500) and iOS 7.0.6 (Build: 11B651) firmware's final version is also available for download via OTA (Over-the-Air) wireless process, by simply going to Settings > General > Software Update option. Apple iDevice users can also Download iOS 6.1.6 IPSW Firmware and iOS 7.0.6 IPSW Firmware for iPhone 5S, iPhone 5C, iPhone 5, iPhone 4S, iPhone 4, iPhone 3GS, iPod 5G Touch, iPod 4G Touch, iPad Air 5G, iPad 4G, iPad Mini, iPad Mini 2, iPad 3G and iPad 2G via Direct Links and can manually install, update/upgrade the firmwares via iTunes.